The Reaction Controller automates the reaction process by controlling reagent addition, temperature control, stirring, data collection and any other required parameter through a single interface. It consolidates the control of various lab instruments such as recirculating chillers, stirrers, and pumps into a single graphical interface. 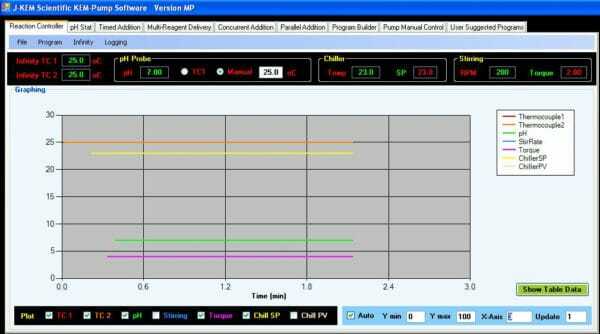 Additionally, the Reaction Controller data logs system parameters such as temperature and solution pH. Adding a syringe pump to the Reaction Controller provides all the functionality of J-KEM’s single syringe pump and automates the addition of multiple reagents to the reaction as a function of time, temperature, and pH. Organizes the controls of the Reaction Controller into a tabbed document in table or graphical form. 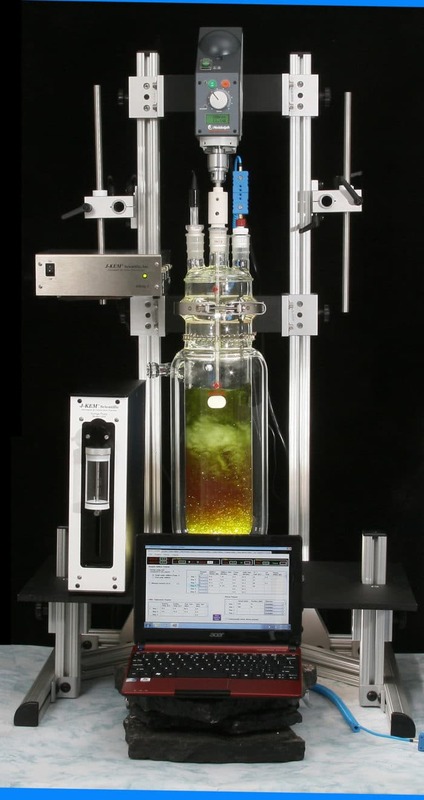 The addition of up to six reagents, temperature control and mixing can be programmed by the user and adjusted in real time and can be customized to meet virtually any reaction or process control requirement. Sensors – Read any analog sensor to monitor and control pressure, flow rate, oxygen or ion concentrations. Instruments – Automate other instruments, such as UV spectrometers, fraction collectors, pumps, and balances by placing them under the control of KEM-RxC software. Digital – Monitor for external events or control external valves, motors, or virtually any other device. A special implementation of the Reaction Controller is as a process controller to map the reaction space around a specific chemical reaction. The Reaction Controller can be customized to run multiple, sequential reactions with easy setup and data logging of all reaction parameters. J-KEM also customizes the user interface to present the controls needed for your unique application.